I have been wanted to do linux kernel hardening a long time ago. I first heard about grsecurity from my friend William who is a security enthusiast. I have read several guides on how to patch the kernel source code but by far this article is the best. I am using CentOS 6.4 for the kernel hardening, before compiling and install the patched kernel the kernel version is 2.6.32-358.el6.i686. Download the development tools and ncurses from yum repos. ncurses is for the menu for configuring the kernel source code to be compiled after the source code was patched by grsecurity. grsecurity does not keep old patches, you can only find latest updated patch from grsecurity download page. Step 2: Grab the patch file using wget. Take note on the grsecurity patch version, it says 2.6.32.60 which means this patch is for kernel 2.6.32.60. Go to kernel.org and download linux-2.6.32.60. Step 3: Use wget to download the kernel from kernel.org. 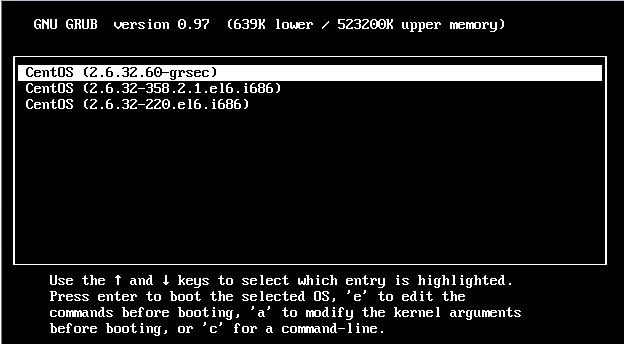 Step 4: Use tar to decompress the kernel which I downloaded from kernel.org. Step 5: Go to the directory of the decompressed kernel. Step 6: Patch the kernel source code with grsecurity patch. Step 2: Copy the boot config to the source code directory. The menu uses the .config. Step 3: Make the menu, this is why you need ncurses. 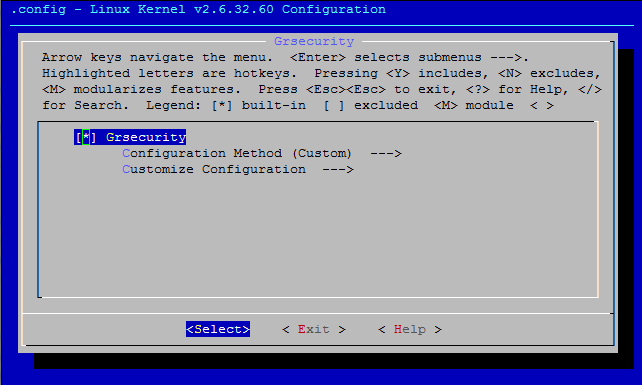 The menu of the configuration before compiling. scroll down until you see security options then press space bar to access. Select grsecurity and press space bar. Either press space bar or press Y to access the options. These are the available options. You can either use automatic or custom config. Default uses custom configuration, but if you want to select automatic select Configuration Method and press enter. Choose automatic and press space bar you will see a lot of options. You can customize the options to suit you needs the current is fine with me for testing. For more information on the customizable options read this. Exit until you see a prompt to prompt you to save the configuration to .config. The following will compile and make the kernel. The modules must be made first before you can use make modules_install command. The next is to install the grsec patched kernel. The installation will also update the kernel to the grub menu.lst file, just make sure you reboot and choose the grsec patched kernel. 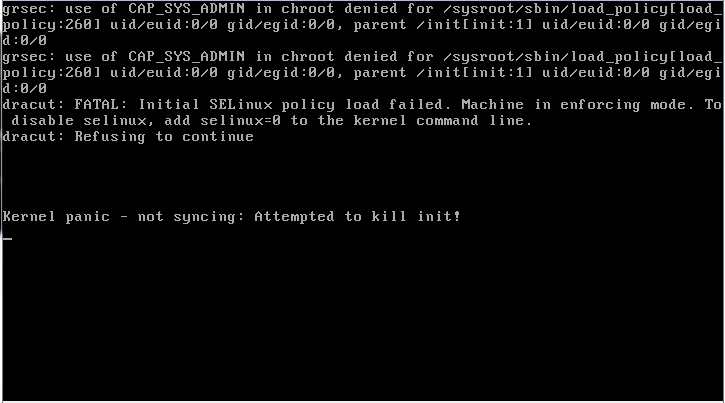 grsec will deny sysroot from loading any policy, in centos selinux is enforced by default, you have to disable it because if policy failed to load your kernel will not be initialized and will be in kernel panic state. I do not need SElinux when using a grsec patched kernel. To disable SElinux permanently change the selinux config in this path /etc/selinux/config with your favourite text editor. the patched kernel is named as grsec as its suffix. This entry was posted in Linux, Security and tagged grsec, grsecurity, how to apply grsecurity patch to linux kernel, linux, OS hardening. Bookmark the permalink. Would you advise the Grsecurity patch for home users who want to be safe against malware, or is SE-Linux already sufficient for that?